He refused traditional medical treatment – chemotherapy –and with the assistance of some of the finest minds in alternative medicine, put together a regimen of a variety of diet, vitamins, exercise, and modern devices not even known to the public, which ultimately resulted in his reversing the trend of the Cancer to the point where today he is 100% Cancer free. "And that wasn't the reason?" animal that never harmed me." In the late 1960s he regularly fasted in excess of 40 days at a time, to publicize world famine. For two-and-a-half years, he ate no solid food as a protest against the Vietnam War. He was still following this regime when he completed several long-distance runs – one from LA to New York – frequently accompanied by Muhammad Ali, who described Gregory as “one of the greatest Americans of modern times”. It can’t be easy, living on raw fruit and vegetable juice for 40 years. At John Lennon’s request, Gregory devised a diet to help him withdraw from opiates and alcohol. Gregory was in Tehran in 1979, negotiating with Ayatollah Khomeini for the release of the U.S. military hostages, and has continued to dedicate his life to publicizing repression. These days,, he rarely performs comedy, he says, but he’s constantly on the road, lecturing on diet and ethics. As we read this passage of Jesus’s so called “triumphal entry” into Jerusalem we must remember that the true meaning of “Hosanna” is not “a shout of praise or adoration” or “to praise or applaud” as the dictionary currently defines it. At the time Jesus’s entered the city, humbly on a donkey, he was purposely fulfilling the prophesy of Zachariah. (Zach 9:9) The people believed that Jesus had come to be their king, to lead them out of an oppressive system of occupation imposed by the Roman authorities. Those cries of “Hosha-na! Save us now!” are still being shouted today by the people who are now living under the same oppressive systems of occupation imposed by the new Roman authority, the Israeli government. As we begin to celebrate Holy Week and look forward to the resurrection, let us continue to be mindful of those whose voices are crying out for redemption, for release from captivity, for justice, for freedom, for the basic human rights that God granted to all people. Let us not only pray for them, but let us join Jesus on that walk to Jerusalem, so that we can do the work He called us to do, so that others can be free. By Debie Thomas I’ve never heard a sermon about Jesus’ sense of humor. If I were to construct a personality profile, based on everything the Church has taught me about Jesus, I’d use words like zealous, compassionate, somber, and gentle. Given the fact that crowds flocked to him so easily, I’d probably throw in a word like “charismatic.” But comedic? Ironic? Sarcastic? No. The Jesus I was raised on was far too serious a man to bother with any incarnation of humor. This week, we prepare for Palm Sunday — the last Sunday of Lent, and our gateway into the trials and triumphs of Holy Week. If your religious history looks anything like mine, you know the routine. You know how to make neat little crosses out of palm branches. You know how to walk in an orderly procession, the lofty verses of “All Glory, Laud, and Honor,” falling from your lips. You know how to cry, “Hosanna!” to your humble but triumphant king. It’s important to remember that according to Roman imperial belief, the emperor was not simply the ruler of Rome; he was the Son of God. For the empire’s Jewish subjects, Pilate’s procession signalled more than a military threat. It was the embodiment of a rival theology. Heresy on horseback. This is the background, Borg and Crossan argue, against which we need to frame the Triumphal Entry of Jesus. That Jesus planned a counter-procession is clear from St. Mark’s account of the event. Jesus knew he was going to enter the city on the back of a donkey; he had already made arrangements to procure one. As Pilate clanged and crashed his imperial way into Jerusalem from the west, Jesus approached from the east, looking (by contrast) ragtag and absurd. His was the procession of the ridiculous, the powerless, the explicitly vulnerable. As Borg and Crossan remark, “What we often call the triumphal entry was actually an anti-imperial, anti-triumphal one, a deliberate lampoon of the conquering emperor entering a city on horseback through gates opened in abject submission.” Elsewhere, Crossan notes that Jesus rode “the most unthreatening, most un-military mount imaginable: a female nursing donkey with her little colt trotting along beside her.” In fact, Jesus was drawing on the rich, prophetic symbolism of the Jewish Bible in his choice of mount. The prophet Zechariah predicted the ride of a king “on a colt, the foal of a donkey.” He would be the nonviolent king who’d “command peace to the nations.” I have no idea — and the Gospel writers don’t tell us — whether anyone in the crowd that day understood what Jesus was doing. Did they get the joke? Did they catch the subversive nature of their king’s donkey ride? Jesus chose an animal that had never been ridden before. Was he telling them that his kingship, his Way, was a new and uncharted one? A risky one? Did they hear him? I suspect they did not. After all, they were not interested in theater; they were ripe for revolution. They wanted — and expected — something world-altering. An ending-to-the-story worthy of their worship, their fervor, their dusty cloaks-on-the-road. What they got instead was a parade of misfits. A comic donkey-ride. A dangerous joke. As New Testament scholar N.T Wright puts it, what they got was a mismatch between their outsized expectations and God’s small answer. Which raises an interesting question. What did Jesus accomplish on Palm Sunday? Did a Roman officer from the “real” procession trot over to check out the disturbance in the east? If so, what did he make of the Clown King? Did he turn his stallion around fast to whisper something ominous in Pilate’s ear? Entry into Jerusalem, circa 1400. I don’t think it would be an exaggeration to say that Jesus’ political joke hastened his crucifixion. He was no fool; he knew exactly what it would cost him to spit in Rome’s face. Like all good comedians, he understood that real humor is in fact a very serious business; at its best, it does more than entertain. It points unflinchingly at truth — the kinds of truth we’d rather not see. The kinds of truth we’ll kill not to see. For those of us who struggle to reconcile the role of God’s will in the death of Jesus, this story offers a helpful but troubling clue: it was the will of God that Jesus declare the coming of God’s kingdom. A kingdom of peace, a kingdom of justice, a kingdom of radical and universal freedom. A kingdom dramatically unlike the oppressive empire Jesus challenged on Palm Sunday. So why did Jesus die? He died because he unflinchingly fulfilled the will of God. He died because he exposed the ungracious sham at the heart of all human kingdoms, holding up a mirror that shocked his contemporaries at the deepest levels of their imaginations. Even when he knew that his vocation would cost him his life, he set his face “like flint” towards Jerusalem. Even when he knew who’d get the last laugh at Calvary, he mounted a donkey and took Rome for a ride. Two processions. Two kingdoms. Two parades into Jerusalem. Stallion or donkey? Armor or humor? Emperor or clown? Which will I choose? I think I’m offended because I’d rather make pretty palm crosses and sing “Hosanna.” I’m offended because the real choices are much harder than I thought they’d be. The joke is over; Jesus’ choice cost him everything. I dare not join his parade too casually. I’ve been to Gaza a number of times over the years, and it’s always a tough, challenging place. Just entering it is bizarre: You go through exit procedures from Israel and then follow a long path over a sewer and through a bombed-out no-man’s-land to a checkpoint in Gaza more than half a mile away. It’s eerie, and walls sometimes move aside to let you through, operated by a remote Israeli operator watching through a camera. On this trip the pathway had been patched up a bit, and the Gaza checkpoint actually offered free wifi – but my Sunday column focuses on the devastation throughout Gaza. As I write, people overwhelmingly say the situation is the worst it has ever been. Aid groups say that not a single home has been rebuilt since the war. Children have no shoes. The economy is pulverized. And there’s a bleak expectation that yet another war is on the horizon. One of the kids I quote in the column, a 14-year-old boy, wants to be a fighter and massacre Israelis – and the cycle goes on. 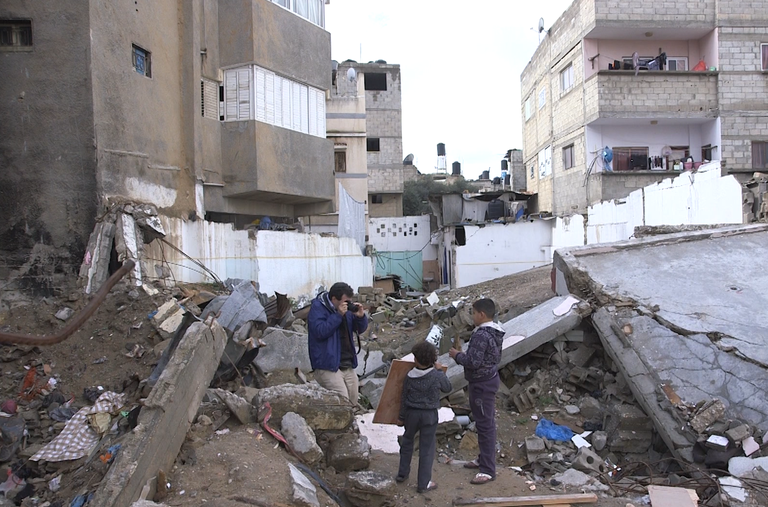 I was in Gaza with Adam Ellick, a senior video journalist for The Times, and Adam made a video of our trip that you can watch here, posted above the column. By the way, I have no great expectation that my columns are hugely persuasive on issues that people already have strong opinions about. You may remember that a week ago, I wrote about how trees donated to Israel are sometimes used to push the Bedouin off their land. One disgruntled couple promptly purchased 200 of these trees in my name, so I received a plaque testifying to my generosity. Hm. My readers do have a sense of humor, I guess. Today, Israeli Prime Minister Benjamin Netanyahu and more than fifteen thousand advocates are on the Hill pressing Congress for anti-diplomacy legislation and new sanctions on Iran. Netanyahu just finished his speech on the floor of the House, where he spoke out against the current negotiations. Your members of Congress are hearing a lot of opposition to diplomacy. They need to hear that their constituents support the ongoing talks with Iran. Please call Congress today, and urge them to let diplomacy work. You’ve already done so much to protect delicate negotiations around Iran’s nuclear program. Thanks in large part to your calls, emails and lobby visits around the country, anti-diplomacy sanctions legislation that was intended to pass in January is currently shelved until at least the end of this month. What’s more, dozens of members of Congress spoke out before Prime Minister Netanyahu’s speech. They question the content and timing of the speech, and the manner in which the prime minister was invited to speak without consulting the White House. Some legislators expressed their concern by not attending the speech, while others voiced their ardent support for the negotiations and opposition to new sanctions. But anti-diplomacy legislation could still shipwreck a deal before the deadline for a political framework agreement at the end of this month. That’s why your senators need to hear from you. Call your senators’ offices and ask that they oppose anti-diplomacy legislation and speak out in support ongoing talks. My name is ______, and I’m from [city], [state]. Please support the ongoing talks to prevent a nuclear-armed Iran and another war. I hope the senator will oppose two bills that could lead to a collapse of the talks: the Menendez-Kirk sanctions bill (S. 269) and the Corker-Graham legislation mandating an ‘up or down’ vote on any agreement reached with Iran. As always, thank you for your tireless work for diplomacy and peace. P.S. For more context about the problems in content, timing and protocol with Prime Minister Netanyahu’s speech, see my blog post with Scoville Fellow Wardah Khalid. People of Israel: You should know that the new-found alliance between your Prime Minister and our Republican Party, the American Israel Public Affairs Committee, and some wealthy right-wing Jews here (such as billionaire Sheldon Adelson), is poisoning the relationship between Israel and the United States. Netanyahu’s decision to address Congress on Tuesday to argue against a nuclear deal with Iran that’s one of the President’s highest priorities, and also to speak to Aipac – just two weeks before your own national elections – foists your own domestic politics onto ours. As such, it is having a polarizing effect here in the United States, pushing many Americans to side against Israel, and thereby posing a long-term threat to Israel’s security. Meanwhile, many American Jews who have refrained from speaking out against the right-wing radicalism that has taken hold in Israel – a radicalism that rejects a “two-state solution” and continues to build new settlements on the West Bank, and which we believe imperils the future of Israel – are now feeling emboldened to do so. Aipac does not speak for us. House Republicans do not speak for us. Billionaires do not speak for us. We have been silent for too long. Alongside the grave violations of human rights and international law of Guantánamo, there is a lesser known set of abuses that take place on U.S. soil in pursuit of the so-called “War on Terror.” These range from inhumane conditions of confinement in federal prisons, both pre- and post-trial, to dubious prosecutions for charges like “material support,” to the extensive surveillance of Muslim communities. The No Separate Justice campaign, a coalition effort that CCR was instrumental in launching, is dedicated to exposing these injustices. They focus on telling the stories of the flesh-and-blood victims of these practices. As part of their work, they hold monthly vigils outside the Metropolitan Correctional Center in Manhattan, where many of the victims of abusive detention practices are held. 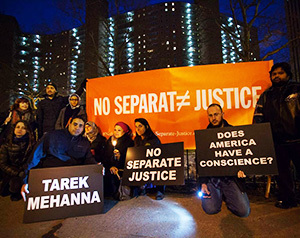 Their rally tonight (6pm – if you’re in New York City, see our event page for details) will feature Omar Shakir, one of CCR’s Bertha Justice Institute fellows, who will report on CCR and Muslim Advocates’ Hassan v. City of New York case, which challenges the NYPD’s systemic surveillance of Muslim communities in New Jersey. The No Separate Justice campaign sits at the intersection of so many of CCR’s commitments, including torture accountability, challenging solitary confinement, and ending Muslim profiling and surveillance.